Glutathione with Phosphatidylcholine Glutathione (GSH) is a master antioxidant protein formed in the liver, that plays an important role in detoxification, immune health, energy levels, endurance, muscle strength, aging and overall disease prevention. What is Reduced Glutathione Reduced or L-Glutathione contains an extra electron, optimized ready to neutralize free radicals. Regular Glutathione supplements often use a cheaper, non-reduced form of GSH which yields little to no benefit. Supplementing GSH levels with a high-quality Glutathione supplement is very important. Liposomal and L Glutathione forms of GSH are the most bioavailable, meaning the body can readily absorb them..
Liposomes are double-layer phospholipid spheres, filled with Glutathione. Used to protect and deliver GSH into specific cells of the body, the Liposomes in our glutathione antioxidant softgels are less than 300 nM in diameter for optimal absorption, ensuring protection from the destructive action of stomach acid, as well as bile salts, saliva and pancreatic enzymes. Experience the Power of Liposomal Glutathione for Yourself. Invest in Your Health Today. GOLD STANDARD CHINA-FREE SETRIA GLUTATHIONE – Setria Glutathione is a tri-peptide consisting of amino acids glutamate, cysteine, and glycine, found to varying degrees in all cells, tissues, body fluids, and organs. Setria Glutathione is a superior reduced L Glutathione that’s clinically shown to increase blood glutathione levels. While other brands use cheaper, Chinese sourced Glutathione, our immune system boost softgels contains gold standard Setria Glutathione, sourced from Japan. NO TASTE, NO SWEETENER & NO REFRIGERATION NEEDED – Glutathione controls the types of bonds formed between proteins and other substances in your body. This master antioxidant amino acid helps protect cells in the body from free radicals, toxins and heavy metals. Glutathione by nature has a strong sulfuric taste. Our Glutathione softgels are great for those who are taste-sensitive. Easy to take, with no unpleasant taste or sweetener added, these GSH softgels also require no refrigeration. SUPPORTS IMMUNE FUNCTION, LIVER DETOX & BRAIN HEALTH – Used in our I.V. infusion clinic between treatments as an infusion equivalent, this Liposomal Glutathione offers the highest absorption. Aiding the body’s detoxification process, it strengthens the immune system and adrenalin synthesis, offering liver detox support during illness and times of stress. Critical for maintaining energy levels, focus and concentration, Glutathione also slows the effects of aging and supports brain health. 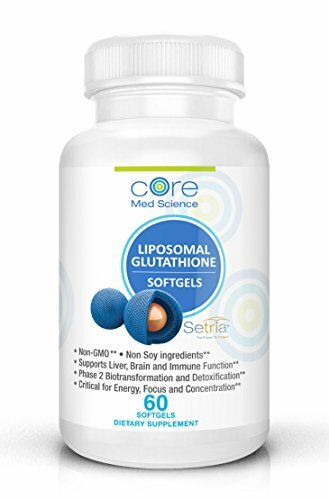 SUPPLEMENTS MADE TO THE HIGHEST STANDARDS – With 500 mg Glutathione per serving, Core Med Science Liposomal Glutathione softgels are certified non-GMO and contain no gluten, dairy or soy. Our liver cleanse detox pills are made in the USA under the strictest GMP standards, as defined and overseen by the FDA. Our stringent Liposomal encapsulation process is done without using added pressure, heat or solvents, and assures the purity and quality that our customers expect. Category: Health Tags: 350mg, 500MG, Brain, ChinaFree, Complex, Detox, Function, Glutathione, Health, Immune, Liposomal, Liver, NONGMO, NOSOY|, NOTASTE, Optimized, Reduced, Setria®, Softgels, Supports, U.S.A.